Bridgette Mokoena is a positive and inspiring woman who is about to undergo a procedure that will make her the first South African recipient of a bionic prosthetic for a partial-hand amputee. Bridgette has worked with Jaco Deist and his team from Deist & Associates in order to make this pioneering innovation in South African prosthetics a reality. 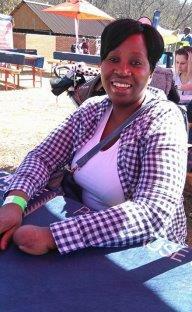 Bridgette is 42 years old and is originally from Kanyamazane in Nelspruit, Mpumalanga. She works as a Management Support Specialist for the City of Tshwane. On 24 September 2010, she injured her hand in a car accident which took place between Belfast and Middleburg. The accident caused the vehicle to roll several times which led to the loss of Bridgette’s fingers on her left hand. Despite the trauma Bridgette has experienced, she has a positive and grateful attitude. Bridgette was not aware of the innovations in bionic prostheses before meeting Jaco Deist – she had only been exposed to artificial limbs that are fitted for cosmetic purposes. Bridgette heard about Deist & Associates through a friend who lost his leg in a car accident. He recommended Deist and his team to Bridgette. When asked how she felt when she realised Deist & Associates could provide her with a solution, Bridgette replies, “I was extremely excited and happy!” The hand will enable her to perform household and work tasks that were once challenging. Bridgette is looking forward to the improvement of her general daily efficiency a boost in self-confidence and the fact that she can re-establish her independence as a women, mother and sister. Jaco Deist is the person responsible for Bridgette’s procedure that also marks South Africa’s first bionic hand replacement for a partial-hand amputee. When asked to describe her experience working with Deist, Bridgette replies, “The experience has been enlightening, motivational and encouraging on account of the passion shown by Deist and his team for the work they do.” According to Bridgette, the team creates an informative and family-like environment. This makes it easy to trust in Deist’s processes, to ask questions freely and to enjoy the opportunity for a new lease on life even after the amputations. The team expanded Bridgette’s understanding of how prosthetics can benefit her. The first step in the process consisted of interviews and a thorough hand evaluation. Then came the drafting and submission of a letter outlining various quotations to the Road Accident Fund in an effort to attain approval for the procedure. Bridgette asserts that the most exciting part of the process was “the evaluation of the hand, by means of testing it with a bionic prosthesis simulator.” She also enjoyed the exercises used to evaluate the efficiency of her hand. Bridgette is looking forward to the procedure and she is thrilled to be travelling to Scotland. She sees it as “a great honour, privilege and blessing” to have qualified as a candidate for the prosthesis. “I’m looking forward to the whole process,” she says, highlighting the training, travel and of course the functional bionic prosthesis that will alter her day-to-day living. Her positivity and light are undeniable traits that are truly inspiring. She leaves us with a message as a testament to her unshaking faith and to her confidence in the passion Deist has for his work. We wish you the best of luck Bridgette: Godspeed!